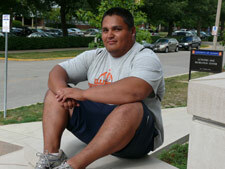 Guillermo Blanco is a senior in the Department of Kinesiology and Community Health. What are your general impressions of the KCH department and your own studies? The KCH department is really great in all aspects. The faculty and staff are fun to get to know and interact with in and outside of the classroom. What has been your best/most interesting/more beneficial experience at the U of I? My most beneficial experience here at the U of I has been being part of the I-LEAP program. The staff has done a really great job helping me get accustomed to everything here on campus. They’ve helped me out with everything from getting on track with my career plans, creating and building resumes and class schedules, to just being there to talk with about anything. I honestly wouldn’t be where I am today without the help of the program. I can’t really pinpoint my “best experience,” but I would say that I’m really glad I became involved in different activities and organizations because they’ve made my experience here at the U of I much better. What extracurricular activities and student organizations have you been involved with? I’m involved in several extracurricular activities here on campus. I am a member of the Kinesiology Student Association, students coming together to promote physical activity throughout campus as well as getting involved with some community service. I am also a member of the Pre-Physical Therapy Club. Additionally, I am a student manager with the football team. My job is to set up equipment the team may need during practice and on game days as well. I also work for Campus Recreation as a facility assistant, and I’m in the process of becoming certified as a personal trainer. I hope to work as a personal trainer for Campus Recreation in the fall. I also participate in the Greek system as a member of Phi Kappa Psi Fraternity, where I’ve held officer positions. Being involved in a variety of extracurricular activities and organizations helps me stay organized, become more responsible, meet new people, and, most importantly, become more well-rounded. After I graduate, I plan on going to graduate school for physical therapy. Eventually, I would like to become a physical therapist for a professional sports team. I like to work out on a daily basis either at the ARC (Activities and Recreation Center) or going for a run around campus. I also like to play different sports with my friends.